I bought this daybed set mostly for the bedskirt and striped shams which I am using with gold sheets. I am so pleased with the material of the bedskirt, it hangs beautifully and looks very expensive. The comforter feels a bit harsh and I am hoping it will soften up with fabric softener. This traditional patterned 10-piece comforter set features a contrasting black-and-white pattern that fits with most decor styles. Crafted from premium 100 percent cotton comforter set cleans easily at home. The set includes a comforter, bed skirt, two shams, three Euro shams and three decorative pillows, each with a coordinated stripe design. I absolutely love this bedding set. It's very durable, quality fabric and simply gorgeous with contrasting pattern mixing. I created a sitting room for one of my smaller bedrooms using a daybed. 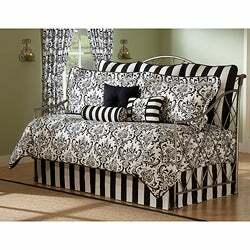 This bedding set really adds beauty and contrast to the room (see picture). I added a few accents pillows to the bedding (not included in bedding set). Also, I purchased black and white vertical black out curtain panel set (two drapery panels included in set) to compliment the daybed. This was an awesome buy at Overstock.com. Beautiful pattern but the 10 piece set was too much for my 13 year old daughters bed. We originally wanted the 5 piece but that item was sold out. The large striped support pillow (or do you call it body pillow?) was abit much with the striped bedskirt. The smaller decorative striped pillows were also too busy on top of the comforter. The set is itself is made of good quality and sewn well. The pattern and look of the set does add a touch of elegancy to the room. We ended up not using the striped body pillow and decorative ones and replaced with other accessories with a different color (burgundy ones bought at another store) to break up the black and white and to add some pop to the set. I would recommend ordering the smaller set (5 piece set) and adding personal touches with accessories. I wasn't expecting to love this comforter set so much, but it is absolutely stunning every time I walk into my room. I love that there are so many pillows that come with the set, and I even added two small, round red pillows as accents--it all looks great together! 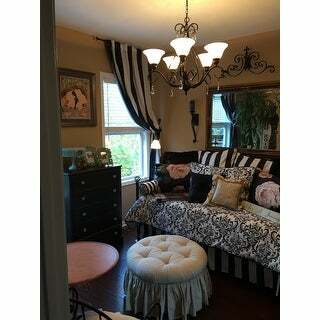 You have lots of options for accent colors with a black and white set like this, so I think it's very versatile. It stinks that it's dry-clean only, though, so be careful! All five of my cats love the bedspread, too. It's not as soft as I was expecting (actually it's a little on the stiffer side), and yet it's still comfortable and cushy enough. Pulling the comforter down lower on the sides and front makes it way less boxy than it appears in the picture, and it looks much better. Despite the high cost, I think this beautiful set is well-worth the money. This quilt set was exactly what we needed. My daughter had been looking for this pattern in a dorm XL twin set for a while and kept striking out. Until we realized that a daybed sized quilt would make the perfect substitute -- and it does! The quality is what I expected and black/white contrast very crisp. I had been looking everywhere for a gorgeous/girly bedding for my daybed in the guest bedroom. You will not find anything like this anywhere else that's for sure and I finally found it here on overstock!! !it is absolutely gorgeous and goes well with the hot pink and black combination. I also want to note that there are NO pillows included aside from the 3-decorative pillows. Everything else is just the shams. You might want to get a larger size euro-pillow to fill them up instead of the standard euro-sized-pillows. You might also wanna get the queen size pillows to fill the standard shams up as well. Other than that this is a great bed set and totally worth the money and even the blankets are made from a high quality/good quality material! Hope this helps! I bought this comforter set for my 16 year old daughter. I am very pleased with the product. It is seems that with day bed sets I have to settle for sets that are mediocre ( I usually make a twin work). This set really makes a statement. I do wish they had stated in the description that the three back pillows were 3 euro shams and that the pillows themselves were not included. This is a great set! Rich color and beautiful design. It looks wonderful in a french country bedroom setting. To compliment the bedding, I made draperies using a Black and White large Toile pattern. I am totally satisfied with this set. It has weight and heft to the fabrics. I love the 3 Euro pillows with their broad black stripes. This is a great buy that cannot be duplicated in any department store. You can't beat the low cost shipping with Overstock.com. Fast delivery too. Loved this set for an extra room but love it more in person. We added some color accent pillows and also bought the Coster Company black and white accent chair for the room. Wow! So much fun and style. I was happily surprised that the pillows came with this set and I think it's a great value. Looks much more expensive. Very happy with our purchase! Quality is excellent. It is not soft fabric though ... A little stiff. You will need three 28" euro sham inserts (I ordered from """") and 2 king pillows for the other shams. I bought the set for my 19 yr old daughter who has a daybed in her college apt and it looks great. It is a little pricey ... It cost more than the daybed! But Worth the price. Perfect Daybed set with quality fabric too! I like nice things, not apologising, I just do! So in looking for a daybed set I didn't think it would be difficult to find one, but it truly was a process. I had purchased another daybed set prior to finding this one and returned it right away...it was literally one sheet of fabric and not inexpensive either. So, I ended up waiting weeks for this set to be back in-stock and praying it would be, and thankfully it was! I knew this would be perfect and the quality is excellent (good weight to it as well, which is what I look for in bedding) and it looks fantastic in my spare bedroom. This product was exactly what I was looking for and worth the money (remember you get 10 pieces...the pillows and pillow cases are very nice too!). Very happy with this entire set and I think others will be as well. Hope this review helps you as much as other reviews have helped me throughout this painstaking process. Thank you! yes, I would recommend this product, definitely!!! This is the most classy daybed cover I’ve ever purchased. Still looks like new. Shape remained great after washing Z. I get a lot of complaints about this set. It was perfect. I would recommend Overstock without reservation. Five stars! I could hardly wait for this to get here to put my new day bed together. It is all I imagined and then some! Looks like an elegant room now,!! Bring on the guests! "Does the comforter have the black and white pattern on both sides?" "Will this fit a full/double sized daybed? If so, is there a way to just get the comforter?" This comforter set is designed for a standard size daybed. "Looks great! Are any of the matching window treatments available?" Hello ally74, unfortunately this item is out of stock. We currently do not have inventory to check, and cannot guarantee the item will be restocked. Thank you for shopping with us. "We have an older type daybed and with 19" from top of bed to floor. Also, the skirt would need to have a "split" to accomodate the trundle hardware on sides. Would this daybed cover set work? I love it!" Hello Windyday, all skirts are split and the drop is approximately 15 inches. This fits almost all daybeds. Thank you for shopping with us! "When will this item come back in stock?" Hello sheila, items are restocked as they become available; however, we cannot guarantee an item will be restocked. Thank you for shopping with us. "Does this come in red?" Hello prissy, this comforter set is unavailable in red. Thank you for shopping with us! "where can you get the matching print drape?" Hello lettucelover, I'm sorry I couldn't find the long drapes I could only find that we have the valance http://www.overstock.com/search?keywords=Arbor&taxonomy=cat1456&sortOption=Relevance&searchtype=Header Have a great day!